VATICAN /Abu Dhabi– Pope Francis is opening his historic visit to the United Arab Emirates by meeting on Monday with the federation’s leader and a group of Muslim elders before addressing faith leaders in a show of religious tolerance in a Muslim region known for its restrictions on religious freedom. Pope Francis’ speech to the gathering later in the evening is the highlight of his brief, 40-hour visit to Abu Dhabi. His trip culminates on Tuesday with the first-ever papal Mass on the Arabian Peninsula – a gathering expected to draw some 135,000 people in a never-before-seen display of public Christian worship here. 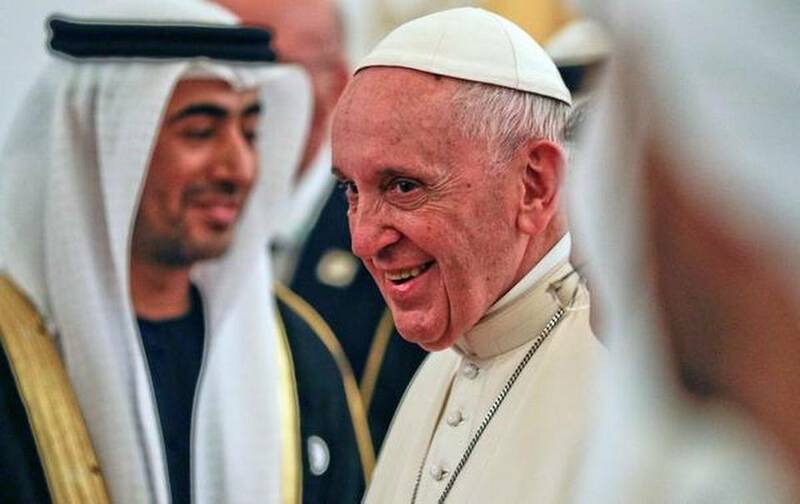 Pope Francis arrived in the Emirati capital late on Sunday and was greeted by Abu Dhabi’s powerful crown prince, Sheikh Mohammed bin Zayed Al Nahyan, who hosts him at his palace for Monday’s official welcome ceremony. The Pope’s arrival followed his surprising appeal on Sunday at the Vatican for the urgent observation of a limited cease-fire in Yemen and for food and medicine to get to its people, who are suffering the world’s worst humanitarian crisis. In a sign that regional politics was playing a not-insignificant role in his visit, the papal plane flew north of Qatar and around the peninsula, an energy-rich nation on his flight on Sunday. Four Arab nations – Bahrain, Egypt, Saudi Arabia and the United Arab Emirates- have been boycotting Qatar since June 2017 as part of a regional political dispute. Tensions are still high between the nations, especially after Qatar’s win at the Emirates-hosted Asian Cup soccer tournament this past week. By avoiding Qatari airspace, Pope Francis omitted sending a telegram of greetings to the country’s ruler, Sheikh Tamim bin Hamad Al Thani, as he would do when flying through the airspace of countries. He sent one when passing by the island nation of Bahrain.